Home Beers Figueroa Mountain Brewing Co.
Hurricane Deck IPA | Figueroa Mountain Brewing Co.
A: Clear, light amber color with over one finger of parchment-tinted foam head. Moderate lacing remains on the glass. S: Strong resinous pine and ground spices make for a classic, if dated, West Coast hops smell. Toasted bread and caramel are also present, suggesting a balanced double IPA rather than a simple palette upon which hops are displayed. No alcohol is detected. T: Begins dry, with savory crystal malt that cultivates an umami quality not often seen in a beer of the style. Hops aromatics are simplistic, following the smell closely but struggling to display focus on any particular quality. Some fruit develops during the middle, conflicting with the hops flavors that turn medicinal. The finish is moderately bitter, with relatively little flavor or character other than some latent mint that is likely lending the medicinal qualities. No alcohol is detected. M: Medium to thick viscosity, very resinous and sticky on the palate, with moderate carbonation. D/O: This DIPA underachieves or otherwise phones in practically every detail of its sensory profile; even the tint of the beer is a shade or two more dark than the ideal. Taken all together, it is not a train wreck so much as something that sneaks across the palate never to be contemplated again. It is hard to imagine the makers of this beer looking forward to a glass of it at the end of the day. Clear copper orange with a foamy white head that laces well. Smells of sweet caramel malt, a pinch of citrus, and herbal and piney hops. Flavor follows with a ton of burnt sugary sweetness. Feel is slick and coats the mouth. Medium feel with good carbonation. Overall, this beer looks pretty inside and out of the bottle but doesn't offer much more for me. Cheers! I poured this into a sniffer glass and got a nice copper colored brew with 1/2 a fingers worth of a khaki colored head that quickly dissipated. The aroma was amazing and had a great woodsy smell to it along with some grass and citrus fruits. The taste is very earthy and piney bursting with hop goodness. The mouth feel is medium to light medium and completely masks the 8% ABV. Truly a great DIPA! Ok...to begin with I must admit I was attracted to the great label and the fact that it is a "double" or "imperial" IPA. Pours well with a half finger of head and nice lacing all the way. feel. All in all an above average brew, if not outstanding. Enjoy! Poured a caramel amber color with two fingers of off-white head. Below average lacing, average-to-below average retention. Smelled a lot like their Hoppy Poppy IPA I had a few weeks ago. Got sweet floral hops up front, followed by caramel and toffee malts. Even a little bit of bubble gum in the nose. Worked nice together. Had me looking forward to the taste. Tasted initially reminded me of Manzanita’s Chaotic, but not as strong. Still got the floral hops. Also Columbus hops coming through. Bitter finish, but not overwhelming. Medium-to-light body. Thin texture. Average carbonation. Long bitter finish. A bit disappointed overall after having a few of their other beers (notably their IPA and brown ale.). Would probably give it another try, since I’m a sucker for DIPA’s, but still. Just picked up a fresh bottle at my WF. Pours a beautiful amber orange with a one inch cap that dissipates rather quickly with thin lacing a I drink down. Nice sweet tropical fruits with a hefty malt backing but not sweet, really impressive balance. The mouth is refreshing and quite pleasant. Over all a very nice effort from this new comer. Will try again. I don't know why the page describes it as an IPA as it clearly states on the label that its a DIPA. orange pour with a nice head. muted smell of hops, citrus and malt. not as bitter or hoppy as I was hoping for, given the description. mild citrus and hop bitterness. Serving Type: 22oz bottle poured into a pint glass. Appearance: Dark amber in color with a short but dense off-white head that dissipates just a little too quickly. Great lacing. Smell: Moderate strength aroma with hops leading. Tangerine, floral, and a hint of grass. Minimal pale malt aroma. Nice but not amazing. Taste: The bitterness hits immediately. Very strong but not the smoothest bittering. Hops taste floral, citrus, and grassy with a slight hint of pine. Just enough pale malt backbone but a touch more would have been better. Mouthfeel: Just a bit under a medium body with nice carbonation and a semi-dry finish. Overall: I enjoyed this beer for the most part but would have liked to see a better tasting bitterness, a touch more malt, and a bit more heft in the body. 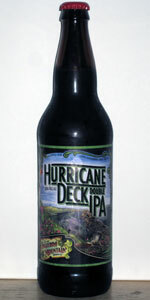 Hurricane Deck IPA from Figueroa Mountain Brewing Co.